This new adaptation of Herge's famous children's adventure stories is a technical masterpiece. Steven Spielberg and Peter Jackson have come together to create a movie using the latest motion capture, CGI and 3D technology to create a spectacular visual experience. The problem is that I'm not sure their choices work, and I'm not sure the story can withstand the heavy visuals placed upon it. The first problem is that Herge's comics have such a particular style, and the motion-cap work seems to come down somewhere between straightforward animation and live-action, creating a sort of eerie look of humans with plasticine faces and over-large hands. I found the mo-cap humans with exaggerated facial features creepy. The second problem is that the movie contains so much swash and buckle, so many car-chases, naval-escapades and exotic locales, that I had no idea what was going on or what was at stake. The whole thing read as a giant MacGuffin, designed to propel us through ever more exciting action sequences. 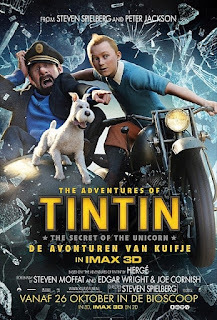 I simply did not care about the clues to treasure that TinTin and his alcoholic sidekick, Captain Haddock, were seeking, nor did I think that they had enough camaraderie to anchor a buddy-action adventure story. Maybe my whole problem is with the character of TinTin himself? I've never read the comic books and I find this strangely asexual boy-scouty do-gooding journo deeply unengaging. So much of this film shares the 1920s action serial tropes that made INDIANA JONES so compelling, but without a loveable rogue as the lead character, there's no emotional entry point. So, count me out for the sequel. 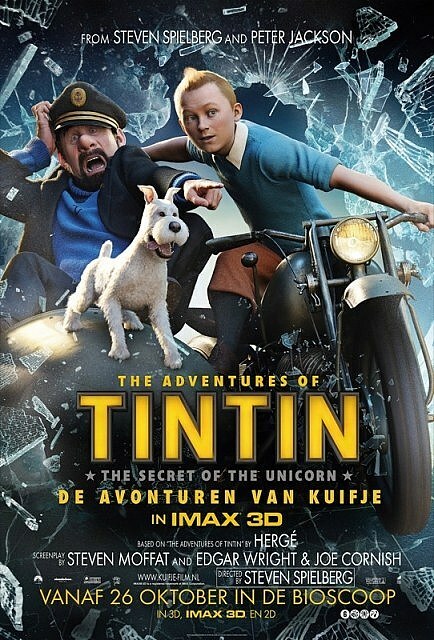 THE ADVENTURES OF TINTIN opened in October 2011 and is now available to rent and own.